Wholesale’s female leaders, top talent and industry experts made history last week, attending the inaugural Women in Wholesale conference at 1 Wimpole Street in London. The event, attended by 100 influential women in wholesale sought to break down traditional sector barriers and covered issues of recruitment, leadership, strategy and gender diversity. Monitor were delighted to be asked to design the event’s conference programme. 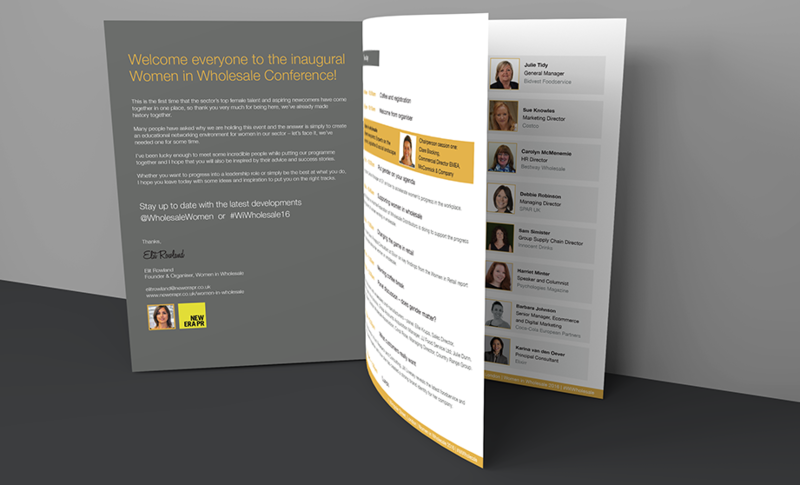 Working with the client, the designers used a grey and yellow colour scheme to complement the Women in Wholesale logo, added photography of the key speakers and panellists and created an easy-to-read attendee list. The aim was to create an eye-catching programme which could be used easily on the day, but also be kept by delegates as a point of reference. At the event, delegates heard from inspiring industry leaders, giving insight on a range of issues affecting women in wholesale. Debbie Harrison, Managing Director of SPAR UK shared her experiences of building an outstanding brand whilst Sue Knowles, Costco Marketing Director highlighted her work to bring women to the fore of the Costco global business. Insightful panel sessions allowed for open discussions between suppliers and wholesalers from across the country. All panellists shared the view that women in business could be further supported, whether through mentoring schemes or through flexible working. Thank you to Elit for hosting such a wonderful event and choosing to work with team Monitor on this project. Find out more about the event here or see the Conference Programme here.